It’s the old age question when it comes to fashion, is there a cut off age for wearing crop tops? Growing up in a Cuban household (at least in mine), unless I was at the beach, showing my midriff was a no no. It was deemed too revealing, not age appropriate, and risqué. I’ll admit, there were a few (okay, many) times, when I would leave the house wearing a sweater because I was wearing a crop top and didn’t want my grandparents to start lecturing me! I couldn’t help it! I loved the trend. As I got older though, I bought into the belief that at a certain age, it was time to retire the cut offs. No self-respecting woman over the age of twenty something should be flaunting her midriff unless it’s in a bikini. Right? Here’s the irony of it all. At 37, after giving birth to two kids and a not-so-toned belly that can look like a possible pregnancy (it’s not), I’ve added a few crop tops to my wardrobe. Gasp! I know, I really didn’t think that would happen. I’ll only wear crop tops with high-waisted pants, shorts, or skirts. It’s a happy compromise! I’m showing only minimal skin, which makes me feel comfortable and confident, but I still feel there is somewhat of an age limit, you know? Again, that’s just my opinion and what works for ME. I’m not baring it all; just a little peek-a-boo skin. There’s a tasteful way to do it when you get a tad bit older. 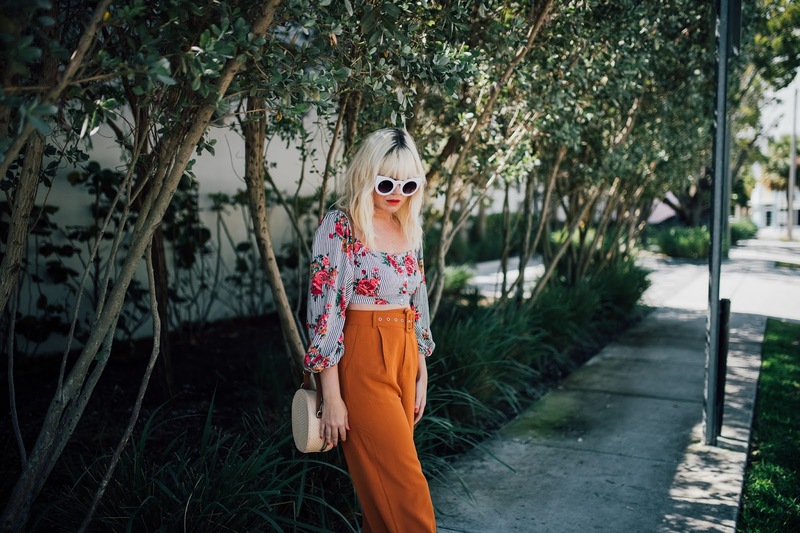 There are so many crop top styles out in stores and it’s all about finding the right one that works for YOU. 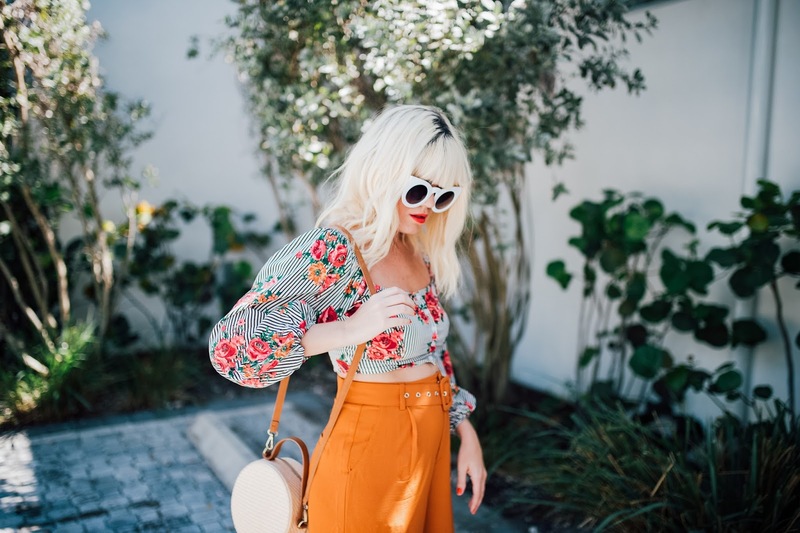 I found this peasant-style crop top at Forever 21 and what drew me to it was not only the bold flower print, but also the long and loose sleeves! As you can see, I paired it with a pair of high-waist belted wide leg pants, also from Forever 21 and look at the smidgen of skin that’s saying hello! Feels right for my comfort level. Who would have thought I would embrace this burnt orange shade?! 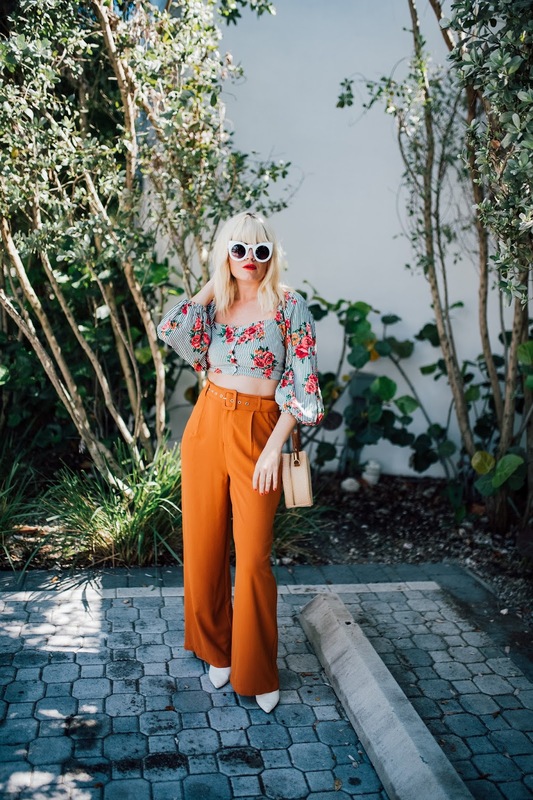 I normally don’t gravitate to colors like these because it’s too close to brown and I’m not a fan of brown, but these I absolutely love and they pair perfectly with the color palette on the crop top! 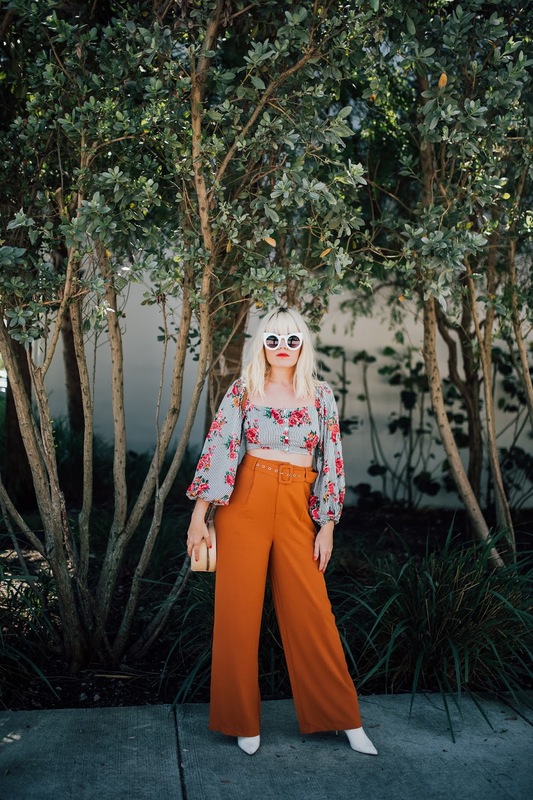 This look is giving me all sorts of Boogie Fever/1970’s vibes with the wide leg pants, the shaggy blonde hair with bangs and the pointy white boots! I told you you would be seeing these white boots all year round! I love love love white accessories! I’ve been into them so much lately because they stand out and automatically pop! Case in point- these great white shades from Amazon Fashion. They’re so in your face! Throw on a straw bag, like this one, and you are living your best summer life- crop top and all! now it’s your turn to answer. Do you crop top? !